Companies across all industries are experiencing major cyber attacks every year. There’s been 53 million online security-related events in 2015 alone, according to a report by IBM. 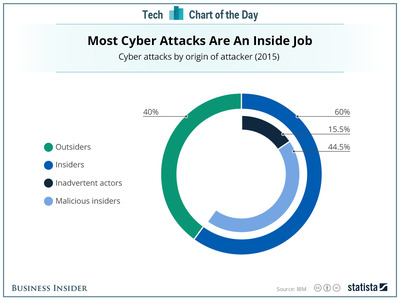 The good news is that 15.5% of the insider attacks were done inadvertently last year, meaning that someone at the company mistakenly allowed an attacker access to the network. That figure has dropped from the previous year, which suggests companies are doing a better job educating and communicating how insiders could help reduce cyber crime.